Amanda’s apartment, which also is her studio, is situated at Østerbro, on the old street Rosenvængets Alle, that to this day is coated in paving stone. Dating back to 1890, the apartment is crooked and skew. It is 130 m2 distributed on three living rooms en suite, a bedroom and a bathroom. Amanda lives here with her girlfriend Josephine, 32. The studio/apartment thought – have you got a couple of lines about that? The thought about living the same place that I work and have my showroom is a way to test out my designs. Is this chair comfortable after a few hours? How does this table react to wear and tear? Etc. At the same time, the idea has also been, that by combining these things, I can get inspired to make new designs. There are already a lot of things that I‘ve been missing in my apartment, which I then have drawn, built and given a new life. For example, I missed an elegant storage solution in my bedroom, so I made a slim wall-mounted book shelve in brass, that has become very popular, and now is produced by the measure for clients. I probably wouldn’t have designed it, if I hadn’t had a specific need for it. Where do you come from? And how has it influenced your way of thinking? I grew up on Samsø and spend my youth in Silkeborg. Both places have stunning nature, each in their own way. Samsø has taught me to breathe right down in the stomach. It has shown me the value of making an effort, patience; that things take time and that nature is the finest thing we have in this world. My childhood has definitely influenced my way of thinking. I make an effort with everything I touch, I try to avoid being stressed, and I’m always present. I accept that things take time and that being impatient, doesn’t get you anywhere. And then my childhood, especially on Samsø, has given me time to reflect and be aware of myself, if I’m feeling good and what I can do differently to thrive better, and I use that every day. I remember to take breaks, pull the plug to get in contact with myself. The more you are that, the happier you are, I believe. It is very different from project to project. Sometimes new amazing things emerge when I’m in the middle of something else in my workspace. Perhaps if I make a mistake, it can lead to a new expression and a new idea. Or I like to start by taking pictures of different scenarios that inspire me. That could be humans, nature or architecture, and from those pictures, I begin to transform my two-dimensional information into three-dimensional forms. The characteristic of my creative process is though that I always start by making sculptures, pure form, no rules for function. And mostly I work 1:1 in my workspace, not on a computer and rarely with sketches. There is a saying: “form follows function”. I work entirely opposite that. I forget everything about function and I focus solely on form. After that, I begin to implement a function in the forms I find interesting. I become limited in my language of shape if I focus on function from the beginning. Therefore, many of designs have sculptural expressions. Great design for me, is when the sculptural expression, function and detail form a synthesis. Almost every furniture in the apartment is designed by Amanda: “Wire chair” materials: white enamelled steel, white leather.“Oak Cabinet” materials: oiled solid oak wood, black enamelled steel. View into the dinning room and Amandas signature design; “Earth Super Ellipse Dining Table” materials: black enamelled steel, brass, metal sheet with self-invented surface treatment. ”Concrete vase” materials: White concrete and brass, together with magazines and brass candle holders.”Linoleum coffee table” materials: black linoleum, Oakwood, black enamelled steel. View into the living room: ”HAN” chair. materials: Velours, black enamelled steel and black-oiled oakwood and “Linoleum coffee table”. What is especially important for you, when you create? To shut everything else out, while I’m in my creative process. To follow my gut and don’t let trends and thoughts about what’s selling and what colours or materials that are popular at the moment affect me. It is all about my inner process and the discoveries I make on the way and about trusting my own eye. And then it is essential for me to feel the materials in my hands. I’m never going to sit and design in 3D programs. I have to feel, touch and see everything in the right sizes. How do you view the Danish design scene today? – is it in transformation or is it sticking to the past and letting itself be hampered by Danish idols such as Wegner? Well, yes and no. 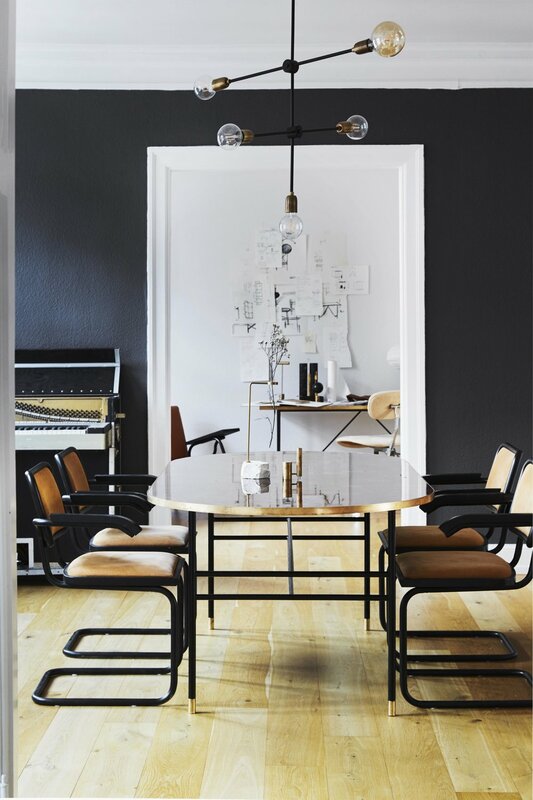 I think it has evolved incredibly the last couple of years and materials that are atypical Nordic, such as brass, stone and marble are dominating more and more, but we are also oppressed by the classical New Nordic style and the old icons, whose furniture there still is a big market for. I think the Danish design scene is pretty safe in its expression and I kind of miss a little more challenging material combinations and language of form. That is what I’m trying to do with my furniture. How do you choose materials and what significance do they have for the product that you are creating? I mostly chose materials based on my curiosity and based on what I find the most aesthetic and exciting in its expression. I also like to challenge existing materials and give them new terms. I’ve done that with my tables. Here I have challenged metal as a material. Made surface treatments on it, painted it and transformed it into a whole new material, with its own story. I think that is quite interesting. The material has enormous importance for the product that is being made. It defines the entire appearance. Therefore, the fact that the materials I use are real and tangible, like stone, brass, leather and steel, is crucial to me. My dream scenario, that I’m working towards, is to have my own studio. I want a team that can help me create and live out my ideas at home and abroad. My role is going to be as creative director, and I want to delegate some of the jobs that I’m doing myself right now. To wake up every day and go to work and together make everything from new furniture to branding, concepts and overall solutions for people who can see the idea in the universe that I’m building up right now, is my dream. Amanda's family counts a lot of professional musicians, and she played in a band as a teenager and still loves to play the piano. Amanda’s project for her graduation from The Royal Danish Academy of Fine Arts Schools of Architecture, Design and Conservation was this oak wall cabinet. materials: oiled oak wood. Drawings and brass pieces from the creative process on Amanda's work desk. ”Linoleum dining table” materials: black linoleum, Oakwood, black enamelled steel. ” Brass objects” materials: brass and ashwood ”Concrete vase” materials: concrete and glass. Bedroom details. The small bed tables are also designed by Amanda: ”Concrete block” materials: died concrete and cement. Bench from Ikea. Amanda has developed a unique technique to make the surfaces on her tables using metal and paint. The surface is very resistant even though it looks fragile — the kitchen where Josephine and Amanda enjoy their breakfast. Amanda in front of her working desk and the ”HAN sofa” in cognac coloured leather. Appealmagazine.live is in love with this beautiful cabinet. We know that Amanda is going to make some round wall art pieces in 2019 - we can’t wait! HER FURNITURE AND OBJECTS DEMONSTRATE A PREOCCUPATION WITH MATERIALITY AND EXPERIMENTATION. ALL OF HER PIECES ARE HANDMADE BY SMALL-SCALE FABRICATORS AND HERSELF, WITH AN HONESTY TO THE RAWNESS AND IRREGULARITY OF THE CHOSEN MATERIAL. WITH AN ACADEMIC TRAINING IN THE THEORY AND PRACTICE OF FINE ART FROM THE ROYAL DANISH ACADEMY OF FINE ARTS, AMANDA APPROACHES FURNITURE DESIGN WITH A SINGULAR AND ACUTELY HONED EYE. HER HIGHLY SCULPTURAL WORK, WHILE SHOWING AN ASTUTE RESPECT FOR THE PAST, IS DERIVED FROM PURE SELF-EXPRESSION AND INSTINCT. THE STUDIO IS BASED IN COPENHAGEN, DENMARK AND BESIDES DESIGNING AND PRODUCING FURNITURE THE STUDIO OFFERS INTERIOR SOLUTIONS. THEY MAKE CREATIVE SPACES WHERE FURNITURE, ART AND DETAILS REACHES A HIGHER UNIT.